New information from Tibet sheds light on important details related to 6 July shootings, beatings and teargassing by China’s People’s Armed Police in Tawu on the 78th birthday of His Holiness the Dalai Lama.On the afternoon of 6 July police detained 18 Tibetans from a bridge on the foothills of Machen Pomra mountain, en route to the famous Tawu Nogen Stupa.Out of them, 14 have sustained gunshot wounds and are receiving treatment. There is no death reported yet although the injured are not out of danger. TCHRD has identified a few more injured Tibetans. Yama Tsering, 72, was severely beaten and got four of his ribs broken. Another Tibetan man, Dekyi Gonpo aka Goleb has become deaf in one ear due to beatings. 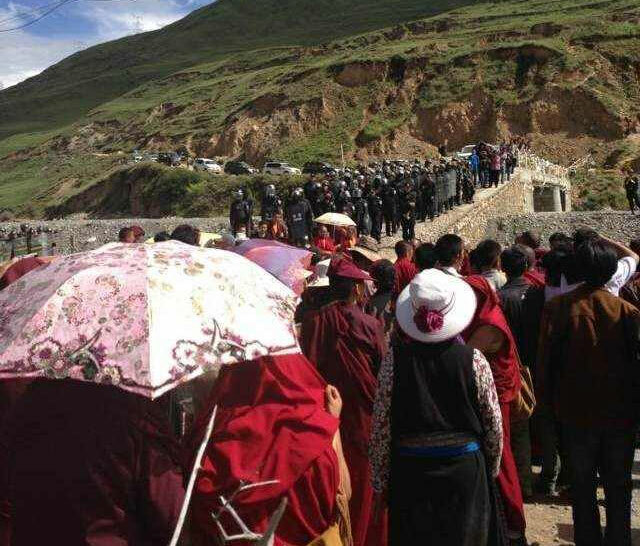 Ngawang, a former administrative staff (Tib: chanzoe) at Nyatso Monastery and a layman named Tamka Choeden have been injured in police beatings. Another female school student named Palden Wangmo, was not only beaten but armed police also seized her gold earrings and a wristwatch. These items had not been returned yet to her rightful owner.